The news that the Porsche 918 hybrid supercar’s time of 6:57 is the 4th fastest official lap time ever registered on the famed Nürburgring Nordschleife and as street legal production cars go , no other car has turned in a better time. In fact, if the Porsche 918 was included on the race-purpose/non street legal list of Nordschleife lap times, it would still rank second overall behind only the Pagani Zonda R while being quicker than the Ferrari 599XX. However, the new 918 hybrid is a normal production vehicle that will be legal in pretty much every country in the world and within those criteria – the new Porsche 918 is the top dog. "The radical hybridisation of the 918 Spyder from the very outset is what made this lap record possible" says Dr. Frank Walliser, head of the 918 Spyder project. "The lap time on the Nordschleife is and remains the toughest measure of a super sportscar. Posting a time of 6.57 minutes, we achieved a result of which everyone in the development team and at Porsche as a whole is rightly proud." The previous record for street legal production cars at the Nürburgring Nordschleife was held by the 2010 Dodge Viper SRT10 ACR, which lapped the 12.9 mile German course in 7:12.13 but the Porsche 918 hybrid smashed that record by some 15 seconds. It should also be noted that the Gumpert Apollo Sport turned in a lap time of 7:11.57 but it is not a normal production car and while a pair of Radical SR8 models turned in times of 6:48 and 6:55 – neither of those race cars are legal in most countries nor are they normal production vehicles. As an interesting note, the Porsche 918 that set the new Nurburgring production car lap time record did so on Michelin Pilot Sport Cup 2 tires. The Gumpert Apollo Sport that ran 7:11.57 was riding on the original Michelin Pilot Sport Cup tires while the 2010 Dodge Viper SRT10 ACR that ran a 7:12.13 did so with the track purposed (yet still street legal) Michelin Pilot Sport Cup R tires. The Chevrolet Corvette Z06 and ZR1 also both turned in their best ‘Ring times with Michelin Pilot Sport Cup tires so it seems pretty clear that if you want a street legal tire that is capable of guiding the world’s most powerful cars around the world’s most difficult road course – the Michelin Pilot Sport Cup series is the way to go. 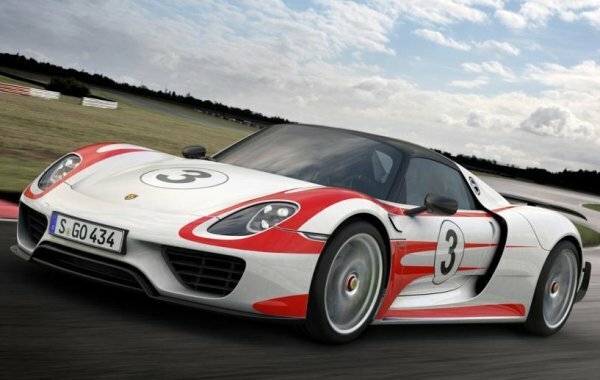 The only “problem” is that the Porsche 918 isnt likely to be a car that any of us see tearing up the local track days and not because it is a hybrid – but because it has a starting price of $845,000. You could buy 8 Dodge Viper SRT10 ACR coupes that set the record back in 2011 and still have over $55,000 left over. However, the new 918 also promises to be one of the most efficient supercars in the world and when you combine the super efficient drivetrain with the simple fact that this car now holds the production car record – being the first to dip into the 6 minute range – those deep pocketed buyers who want to brag about owning the world’s best performing car could be quick to snap these up once they reach production. For those of us who will never be fortunate (or rich) enough to lap the Nurburgring in the six figure super Porsche, the German automaker has put together a short video of the record setting run which we have included below. Enjoy!